Discussion in 'Downhill & Freeride' started by Eren, Feb 28, 2008. 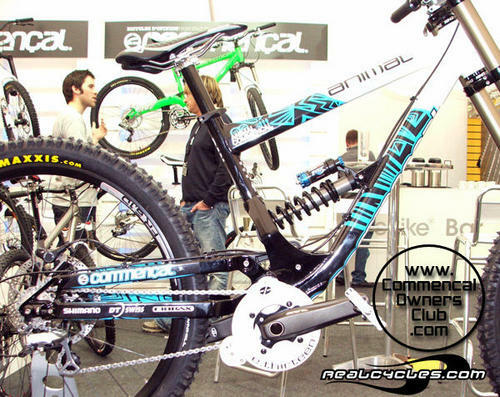 Jason told me he saw the new Commencal bike while browsin around online, and it does look rather sick! 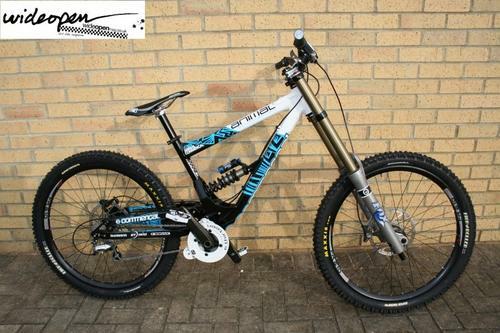 stepin it up to 8 inch bike for 2009.
the new bike for the Atherton clan. There we go. Cedric was on that bike on and off last year. I actually got the opportunity to ride it a bit in Chile last year and seemed really nice (on stairs and cobblestones, ha). Is it the 2009 supreme dh? what cedric had been riding for rougher courses? Is that the actual equipment they're going to use? it does look ultra low, i wonder what the bb height is. Those remind me of f5's, izumus, rm7's etc... Take the rear arm and put a peice from the lower to upper and its unilink design. mmmm lighter trek session 10! looks nice! i think you have your analogy backwards here... the trek session 10 is a commencal after eating an entire tub of butter and a box of krispy kremes. I've ridden the sesh 10, and the supreme dh bike. the trek is a great riding bike, don't get me wrong, but I def wouldn't put it in the same class as the commencal. As a Sunday owner I envy the easy access to the shock adjustments. as a commencal owner, i envy your sunday. it looks super low and super slack, lovely! by the push rod on to the linkage? i guess time will tell? eh, I hate curved downtubes. the geometry looks sick though. 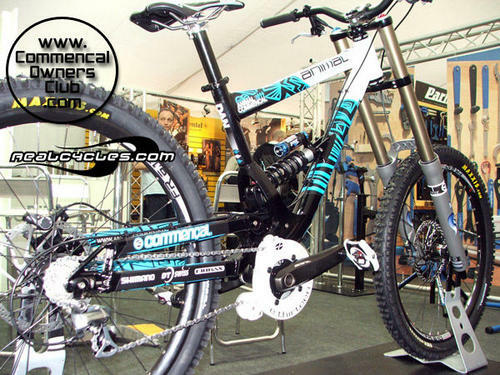 The new Mini DH for 2009 is based on the same platform. i have the hots for the mini dh. the supreme dh (is it even called that anymore) looks way too slack to be used on anything except world cup courses. looks like they have lowered the pivot the point a fair bit too. yea, but unless it has a +/- 2 degree change in HA it wont bring it back to whats acceptable for mere mortals. anyways, thats just a observation. 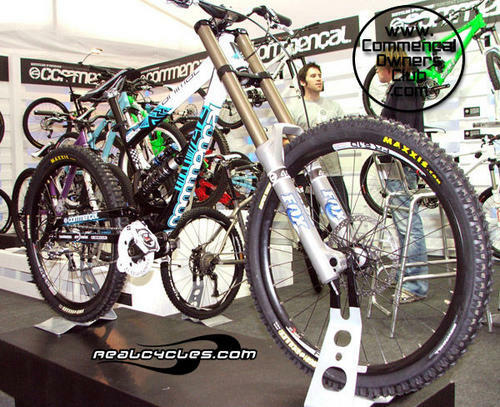 i do at time complain about the HA on my commencal being a bit too steep. just that it would be impossible to ride on slower tight courses with such a long wheel base, which are non existent on the world cup. The pivot looks a bit low from the pics. With the lack of rear wheel movement, it seems like it might get hung up more than a bike for that purpose should. But that's only going on four odd-angled pics. Saw this on Pinkbike yesterday. Looks nice. Much like the Turner!!! 222mm or 241mm eye to eye shock? was looking at that bike in the flesh yesterday and the shock thats in that one is the wrong size, its a bit on the short size. The atherthons hadn't got there propper shocks from fox yet so they just popped that one in for display so its not as slack and low as the pic shows. Its ment to have a 241mm shock but that one isn't. To me it will be a tad high for my liking i reckon around the 14.5" mark. I was chatting to the guy in the background of the pics in the grey t-shirt he was one of the guys from Commencal and he said it would be available towards the end of the summer. He also mentioned that the following version as in 2010 would be a bit lighter, but for this year they just wanted to get the geo, suspension and durability right before they started going lightweight. He did however hint towards the posibility of lighter tubing being used in the future. is it me or does the bike look way slack? That photo is a bit deceptive, it's using quite a wide angle lens I think and the front wheel is a bit closer to you than the rear wheel - all accentuates the angles/proportions? 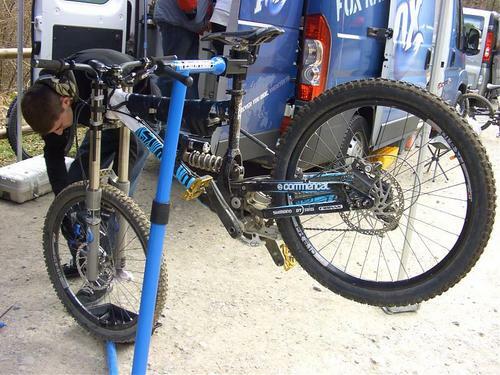 I think the display bike had a shorter than stock rear shock on it which resulted in the wacky geo. I rode the 2009 Mini DH and 2009 Supreme DH in Tenerife last month, they are booth amazing new platforms with great geometry. I still cannot believe how well the new Mini DH railed corners and manualed, much lower standover and greater shock leverage ratio.